If you are a cigar connoisseur, you will love our Cigar vape Juice. It is rich and smooth and will satisfy your craving for a cigar, without the heavy smell, dense smoke and ash. It is the liquid of choice if you are looking for a new e-liquid flavor or trying to find something that is similar in flavor to that of your favorite cigar. 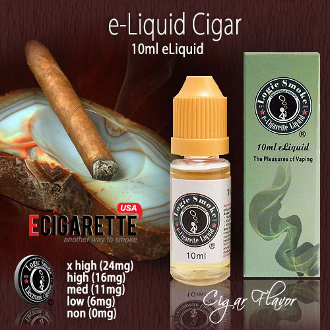 Try some of our Cigar e Juice today.